The current market turmoil has left people scrambling to find safe places to put their money. The Dow Jones Industrial Average has just completed one of the worst years in its history, and many people are currently allergic to the stock market. Now, I'm not a registered financial advisor, so always try to seek out professional help before making any decisions about your money. Over the next few weeks, I am going to be talking about some offers that have caught my eye. The first is the 24-month Online CD (Certificate of Deposit) at Washington Mutual Bank. You are probably thinking - Washington Mutual? Yes, that Washington Mutual. JP Morgan recently acquired the deposits, assets and "certain" liabilities of Washington Mutual's banking operations. If you are worried about signing up for a CD at Washington Mutual, don't be - your money will be insured by the FDIC up to the maximum amount allowable by law. In terms of JP Morgan - they are probably by far the most stable financial institution of any in the United States of America, and perhaps in the world. Anyways, back to the Certificate of Deposit. This is strictly an online CD account - you apply for the Certificate of Deposit online (link below). 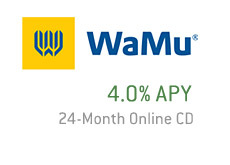 The CD pays an impressive 4.0% APY for a 24-month term. APY stands for Annual Percentage Yield. The minimum amount that can be invested in one of these CD's is $1,000. The application can be completed online, and according to Washington Mutual's website, will take about seven minutes or so to complete. There are short terms as well if you don't want to lock your money up for 24 months. There is a six month term available at 2.00% APY, and a 3.00% APY kicks in at 8 months. If you wish to lock your money in for longer than two years, then there is a 36, 48 and 60 month term available as well. You can withdraw your money early, however penalties will apply. The site will go over these penalties and any other fees with you during the sign-up process, so make sure that you review the material presented to you during the sign-up process.